Made for screens 1152x864 or higher. Video size is 401x225, so just use that size for any video you put in. Whoa! This. This is freaking great. Is there any way to Change the Video? I'd Like to Change it to the original Transformers Cartoon theme. wow it looks sooo real i like it.... maybe next time ill save it as my layout. love the layout and love, love the movie!!! 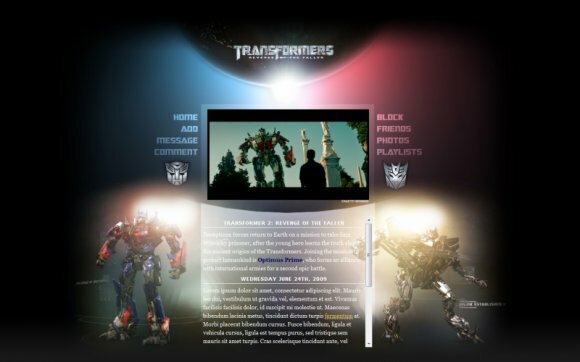 Amazing layout, even though I don't really like Transformers. :O THIS IS RIDICULOUS!! I've never seen the movie yet, but because of this, I think I actually will. such an amazing job. The colors are jaw dropping and structure is just cant be put into words.